This is the house where Lotta and her big brother Jonas and big sister Mia-Maria live. On the street outside, Lotta learnt to cycle. And it was here that she decorated the whole garden with chocolate Father Christmases and marzipan pigs from Vasilij’s sweetshop one Easter morning when the Easter Bunny didn’t come. And it was outside Blomgren’s service station around the corner that she found the Christmas tree that had fallen off a lorry on that sad day when her dad had come home and said that all the Christmas trees in the town had been sold. SF’s film about Lotta (‘Lotta på Bråkmakargatan’, in Swedish) was shot here in 1992. 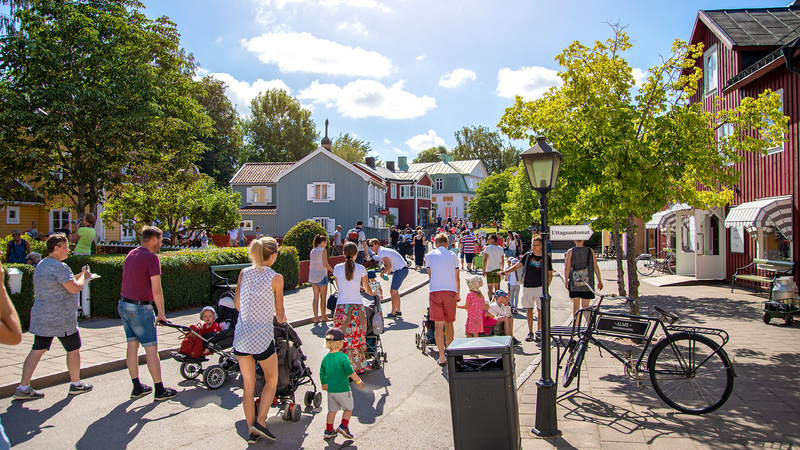 In Astrid Lindgren’s World, there is also Small Troublemaker Street, which was built in 1988. This is a play environment of a child-friendly size with houses that have been equipped with a range of utility goods.